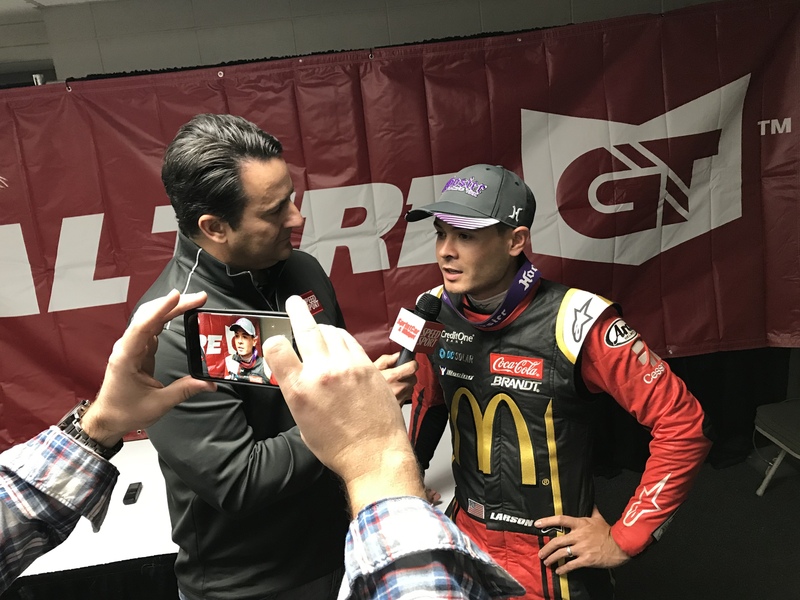 The 12 Questions series of driver interviews continues this week with Kyle Larson of Chip Ganassi Racing. This interview was recorded as a podcast, but is also transcribed for those who prefer to read. I’m an iPhone user. All Apple. It’s just simple. Life’s simple with Apple. Usually when a dirt fan walks up and starts talking about a race, that’s a good way to get a good reaction out of me. Or just have your camera ready, and then usually I think that would put all of us in a better mood and more willing to chitchat for a minute. But I enjoy interacting with people. They don’t even have it out of their pocket yet. Yeah. Yeah, I guess a little bit. If somebody cuts you off or something like that, then at least in the race car, you can run into them and show your displeasure. Where I guess on the street, if somebody cuts me off, I just tailgate them for a couple miles. Yeah, or at least until they turn. So I would say it’s similar, just you can’t run into somebody on the street. I don’t do any hand gestures though because when we’re on the racetrack, you can do a hand gesture because you know you have backup when you get to pit road (for a fight). If you do a hand gesture and somebody gets you to pull over on the side of the road, they’d probably beat you up and you don’t have any backup. I’ve had times like where I’m rolling around yellow and maybe I didn’t get (the HANS device) clipped in all the way and it becomes unclipped under yellow, but I usually have enough time to get it hooked back up. Gosh, yeah, I don’t think I’ve had anything too sketchy. I feel like I have really safe equipment. My Arai helmet’s been safe and so yeah, knock on wood, I haven’t had anything crazy happen. You wear like a strap version of the HANS, right…? It’s a Safety Solutions (Hybrid Pro). Simpson owns it now, but it’s called a Hybrid Pro. Why do you do that? More comfortable? I was like their test dummy kind of back when I was 10 or 11 racing go-karts, back when they were first getting started, at least with the youth stuff. So I’ve always used their stuff; back then it was called like the R3. So I kind of developed their youth stuff and I’ve just always used it as I’ve gotten older. I think it’s a safer device than the HANS, I think because it clips to you and it still is working somewhat if your belts were to slide off — which I’ve never had my belts slide off. But when I wear a HANS, I don’t feel like it’s that tight on me and it’s not doing as much for me. And it’s a lot easier on your collarbones too, especially for dirt racing. A lot of people break their collarbones with HANS (devices). Maybe like a couple cheeseburgers and a root beer float. I wouldn’t recommend eating any of that. I hope that’s not a personal experience. Oh. I believe there’s life in outer space. I don’t know if they race, though. Maybe. Wow. Yeah, there’s gotta be life in outer space. I feel like I’ve seen some UFOs before, so I think there’s life. Do they race? I don’t know. I would hope they do. That way I could maybe go race in outer space. When you cross over to the various series, you can be one of the first intergalactic racers. He’s out of this planet. Yeah, you’re right. Dude, so I remember, I was driving through Sacramento, so this is right by ARCO Arena where the Kings used to play, and I’m cruising up (CA Route) 99 and out the right side there’s a bunch of little colorful objects, like zipping around back and forth as random as could be, like all different directions for a least a minute while I was driving. And I was just staring at them, I was like, “What the hell is this?” It wasn’t like a drone, because there were multiples and they were flying fast. Pretty low to the ground. Probably 50 feet off the ground. But just little lights. Maybe I was crazy for a second. But no, I swear I saw something funny. I dread driver intros. Davis (Schaefer, his PR rep) could admit that I’m the last one up to the intro stage, just because it’s awkward. It’s like going to lunch in junior high and you’re like, “There’s the cool table and there’s the nerd table and there’s my dirt friends. I’ll go stand with my dirt friends.” So we usually just talk about dirt racing, so I’ll stand around (Ricky) Stenhouse and (Ryan) Newman and (Clint) Bowyer, and Denny Hamlin’s getting into liking dirt racing, so he’s usually around. We’ll talk about stuff because we’ve all watched (streaming service) DIRTVision from the night before, so we’ll talk about that. But yeah, I hate intros. I don’t go up there early. There’s drivers that get up there (early) — I feel like Martin Truex is always the first one up there and he qualifies good (which means he show go up later). I’m like, “Man, what are you doing up there so early?” Because he’s quiet, he doesn’t talk to anybody. But yeah, so I don’t like going up there early. Yeah, so we both get to get that out of the way. But I don’t know. Doing the 12 Questions and just getting ready to get this season started. It was a short offseason, but I get to go racing full-time again. No. (Laughs) There’s probably other sponsors out there that would sponsor us and not do that. Yeah, and I’d just go sprint car racing in that (case). So no, I won’t wear a clown nose. I would maybe wear the long hair, but not the clown nose. OK, 62. When is this from? So I’ve had this question before. That’s true, actually. I should look up your answer and see how it compares. OK. But don’t tell me how I answered it. Do you ever get mistaken for another driver or celebrity? So that was back when I had Target, so I was red. I didn’t get Stenhouse all that much. So now I get Stenhouse a lot. Yeah. It even happened today downstairs. Yeah. So I get Stenhouse and Chase Elliott the most. At least Chase Elliott has dark hair. Yeah. And Chase Elliott and I actually look a lot alike in our baby pictures and such. But yeah, I get Ricky a bunch. Ricky probably the most. And Ricky gets me a lot, too. What? I don’t see that at all. I don’t understand how that’s possible. Do you want to guess who you said back in 2015? Yeah. (Laughs) I don’t get mistaken for him, he gets mistaken for me. 12. The last interview was with Joey Logano. He wanted to know: What is your plan to help our sport and our community in the next year? What are you goals to make what we do better outside of the race car? That’s deep. Well, Joey does a really good job at all that. He’s probably like the best these days when it comes to community stuff. I don’t have a Kyle Larson Foundation or a charity really that I have focused on or spent a lot of time or effort on helping. So I guess that’s something I can do in the next year or so, maybe set up a foundation, figure out what I want to give back to and help out, whether it’s sick children or just people in need, really. There’s a lot I can do. I guess try to take the next step into all that as a professional athlete, because I think a lot of professional athletes, that’s what they do, is give back to the community. So that’s something I need to grow up and do, but I still don’t really know how exactly I’m going to do that. Do you have the question I can ask the next driver? It’s Aric Almirola. He recently introduced me to his grandfather who raced sprint cars, so maybe ask him what race stands out to him of watching his grandpa the most racing sprint cars. Do you regret doing these 12 Questions? That’s the last question. That’s been more than 12 questions now. There were so many things to love about the entire Roval weekend before the race even started. The hype was real, the freshness of a new course injected a boost of enthusiasm into a long season and the whole thing replaced a traditionally ho-hum event with a huge unknown. Given all that, the Roval was probably going to be viewed as a success even if the race turned out to just be OK.
At least they tried something different!, people would say. Most of it was a fuel-mileage affair, where drivers tiptoed around the track and kept themselves out of trouble — which honestly was fine! That was the smart thing to do, and the strategy and doubts over whether they could make it to the end on fuel offered enough intrigue to keep fans interested. But then the race suddenly delivered on its potential for chaotic entertainment — and without crossing the line into shitshow territory. Brad Keselowski stuffed it into the Turn 1 wall and the other leaders followed him into the barrier like the old Lemmings computer game. As it turned out, it wasn’t even the craziest moment of the race. As the playoff elimination battle was unfolding behind the race leaders, Jimmie Johnson saw a chance and tried to pass Martin Truex Jr. for the win — only to ruin both of their races. Just like that, Ryan Blaney drove through the spins and ended up being declared the first official winner in a Cup Roval race. But the unofficial winners were many: Marcus Smith, the father of the Roval who saw his brainchild come to life in a majorly successful way; NASCAR, which continues to have an excellently fun second half of the season; and the fans who came from all over the country to check the Roval out for themselves, then surely left feeling like they got their money’s worth. Damn. When NASCAR is good, it can be so, so, SO good. And this was one of those weekends. I got so much enjoyment out of the entire Roval experience; I can’t imagine anyone feeling otherwise. Imagine you’re Jimmie Johnson on the last lap. You barely made the playoffs, haven’t won all season — and hear about it constantly — and now you see an opening to grab a victory with a last-turn pass in the playoffs. Now tell me you’re NOT going to go for it there. Really? Come on. I don’t believe you. Yes, Johnson screwed up. Yes, he threw his playoff hopes away. But those type of calculations can’t possibly be factored in during a split-second decision. Gee, what if I try to pass him, but spin myself out and then get passed by seven cars and miss the next round? There’s no WAY that would even enter a seven-time champion’s mind! Winning racers don’t think that way. He saw a chance and went for it. I don’t even think it was that much of a “just gonna send it!” type gamble; he just messed up. “If I knew the outcome was going to be that, no (I wouldn’t have tried it),” he said. “I want to stay alive in the championship points. But I really felt like I could pull that pass off. Of course he regretted the move with hindsight factored in. But at the time, you wouldn’t want him to do anything differently. Truex seemed to have a much harsher viewpoint, though. He showed his displeasure by spinning Johnson out after the race — which is understandable, given the lost opportunity to win and get five extra playoff points. Someday, when we compile all of the great NASCAR moments from the otherwordly talent that is Kyle Larson, let’s not forget the last lap of the Roval. Larson was out of the playoffs for about 20 seconds until he somehow drove all the way around the track with a wrecked car and passed Jeffrey Earnhardt about 100 feet before the finish line. I knew I was in bad shape, so I guess you could say (I was) giving up. I couldn’t even drive my car, it was so badly destroyed. So I ran hard through (the oval Turns) 1 and 2 and through the (backstretch chicane), and then I blew a right front (in the) center of (oval Turns) 3 and 4 and plowed the wall. I was like, “Crap. I don’t know if I’m going to be able to get down to make the (front) chicane.” But luckily, it came down off the banking and I could turn right OK. So I got through the 16th corner, and then I hit the wall again on the front stretch, and (Earnhardt) was stalled the whole time. He was like 100 feet from the start/finish line. I could start to see him creep in when I was getting to 16. I was like, “Gosh, don’t go! Don’t go!” And we were able to make it. Hey, I was pretty lucky. To add to the barely-made-it storyline, there’s this nugget: NASCAR gives drivers with damage three laps to meet minimum speed. Larson, who had no chance of getting back up to speed, was on his third lap. So had the race been one lap longer, he would have been eliminated through that rule alone. How have we gotten this far without talking about Ryan Blaney? He won the race, after all. Blaney might have seemed unusually chill after the race in some of his interviews, but that was because he didn’t really know how to digest the win. He appeared almost apologetic at times, like a driver who wins a rain-shortened race or through some other fluke scenario. This really wasn’t in the same category, though, since he put himself in position to win if something happened. The leaders have wrecked and given the win to the third-place car many times in racing history — though not necessarily very often on NASCAR’s biggest stage. The bottom line is he shouldn’t feel bad about it. But Blaney also isn’t the type of guy to be overly impressed with himself or brag in the first place, so feeling like he didn’t really deserve it was consistent with his personality. Blaney said that scenario had never happened to him in any race he’d ever run — including quarter midgets as a kid. So he just wanted to remain humble while also acknowledging the victory was worth celebrating. Two big names are out of the playoffs after Round 1 — Johnson and Denny Hamlin — while young drivers Erik Jones and Austin Dillon also saw their hopes of gaining additional playoff experience come to an end. Left behind are only two Toyotas — Truex and Kyle Busch — and three Chevrolets — Larson, Chase Elliott and Alex Bowman. Everyone else? Well, it’s a LOT of Fords. All of Stewart-Haas Racing and all of Team Penske has advanced to Round 2, setting up for a Ford-dominated playoffs just three years after the manufacturer was completely shut out of the final four. — Round 2: I can potentially see the second-round eliminations being less shocking than the opening three races. I’ll pick Bowman, Blaney, Aric Almirola and Clint Bowyer to get eliminated this round. — Round 3: That sets up a final eight of Truex, Harvick, both Busch brothers, Keselowski, Joey Logano, Elliott and Larson. Out of those, Truex, Harvick, Keselowski and Kyle Busch will advance to the final four (not going out on a limb at all, in other words). — Champion: I’ll stick with Harvick as my pick to win it all. For now. In this goofy special edition of the podcast, half of the NASCAR playoff drivers took a few minutes on Media Day in Las Vegas to discuss a variety of subjects. Topics include Ryan Blaney’s Twitter emoji, what reporting style they’d use if they became a media member, Kyle Larson’s upcoming mid-playoffs wedding and the proper dress code for a racetrack. The podcast features appearances from (in order): Denny Hamlin, Kyle Larson, Erik Jones, Ryan Blaney, Brad Keselowski, Kyle Busch, Alex Bowman and Martin Truex Jr.